I'm having a really (REALLY) hard time not posting about all things Christmas. I know it's not even Thanksgiving, but I'm one of those people that wishes Christmas could be celebrated all year long. Anywho, I will do my best to wait and I'm trying really hard to just keep thinking Thanksgiving over and over. I'm not hosting my own Thanksgiving this year, but I hope one of these years. To prepare I have been collecting DIY decor ideas that would be super cute for any Thanksgiving table. Acorns are free- can't get better than that. Just collect some acorns outside, drill some holes in them, and then string them on wire to make a super cute napkin ring. Oh, and I often times find acorns without their tops attached but I grab a bunch of them too. Just use a hot glue gun to reattach the tops. Done and done. I'm really into felt lately (more on that later). It requires no sewing and is available in so many colors. Just print out some leaf templates from online, you might want to blow them up in size, and cut them out from your felt. 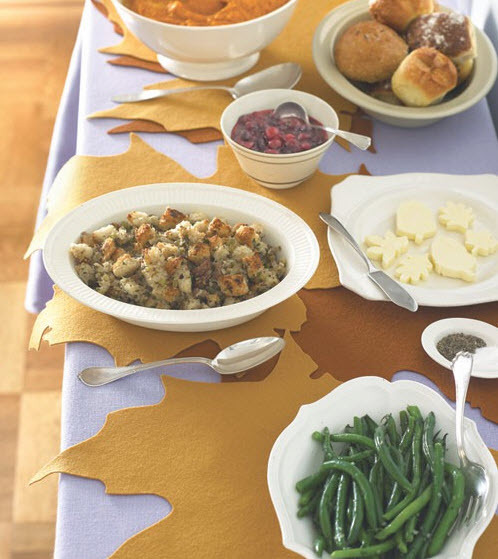 Layer them on your Thanksgiving table for an instant tablecloth. Bonus, if you double the felt, they work as a trivet as well and will protect your table. Love these turkeys, they remind me of those hand turkeys I made in preschool. This is a cute way to make placecards and you can even get kids involved in this craft. Nothing says Thanksgiving like a good old fashioned construction paper turkey, right? Halloween is over but pumpkins are still cool. Just take some white or orange mini jacks and use your drill with a forstner or spade drill bit (the width of your tealight) to drill down halfway in the pumpkin. 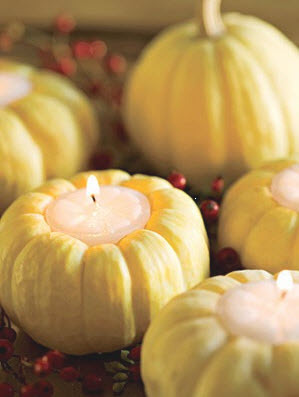 After your hole is drilled just plop the tealight in and you have the perfect Thanksgiving table votive. Other items that can be incorporated into a Thanksgiving table are: Indian corn, feathers, corn husks, apples, pomegranites, nuts, dried leaves, bittersweet, gourds, cranberries, flowers, cabbage, pinecones and so much more! The possibilities are endless. 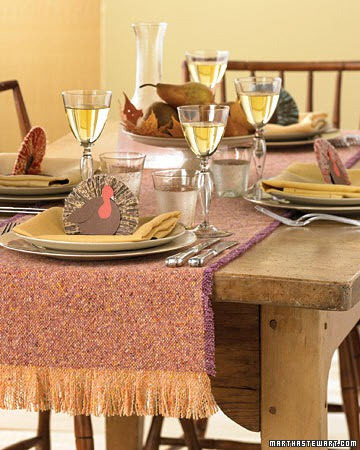 What decor are you planning for your own Thanksgiving table this year? Do share. PS- thank you everyone for all the sweet birthday wishes! I had an amazing weekend full of surprises and love from friends and family. I was absent yesterday because, as predicted, I was still paying for my celebrating, oops. The napkin rings and pumpkin candles are super fun.They would make a wonderful Thanksgiving table. Yes! I have been watching Elf, making sequined ornaments and countdown loop chains with my kids like crazy. Freaking LOVE Christmas. Turkey and pumpkin pie are good too, but the day after Thanksgiving I could care less about Black Friday. I am off to get my tree. Happy belated birthday my dear! Welcome to the thirties club! I try to wait until after Thanksgiving to think about Christmas too but it's slowly sneaking into my life. I too am into felt designs lately, a la Matisse. Adore doing the mini pumpkin tea lights! the pumpkin votives are my favorite! you could even spray paint them for a different look. I kniw when u do hqve one it will be beautiful!! Happy 30 th!!! 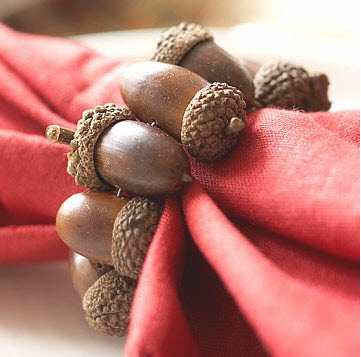 the acorn napkin ring is so adorable, I'll have to remember it for next year!